"Small government" politicians have concocted an insidious corporate welfare scheme in which taxpayers will be subsidizing the wholesale theft of homes and the decimation of the environment to make iPhones. Politicians—who claim to be for limited government and free markets—are engaging in an insidious plot to seize homes from families and give them to the Taiwanese manufacturing giant Foxconn. Not surprisingly, the plot is being hypocritically championed by those who claim to be for ‘small government,’ like President Donald Trump, Wisconsin Governor Scott Walker, and Paul Ryan. The factory will be used to manufacture LCD screens for iPhones, iPads, and other electronic devices. It’s being sold to the population as a means of creating jobs, but it’s hardly going to register as a blip on the job market especially considering the billion dollar endeavor that it will take to create it. The irony of Republicans using big government tactics to take homes from innocent families to benefit a foreign company to create a measly 3,000-13,000 jobs is glaring. To those who champion the free market, the state using imminent domain to seize property is nothing more than theft on a massive scale. 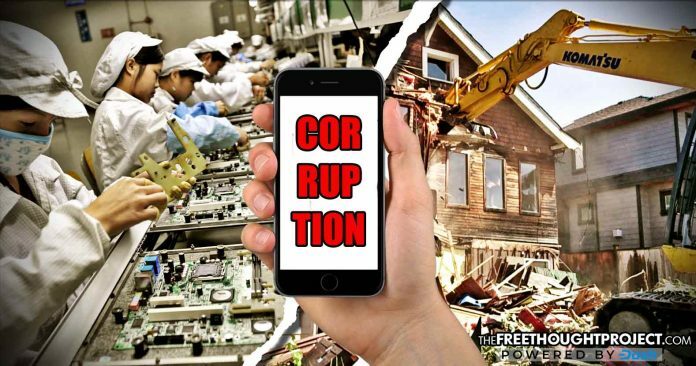 Many people, even small government republicans and libertarians, are able to look the other way when imminent domain is used for public utilities and the like, however, in this instance it is being used to benefit a company from Taiwan—to make iPhones! What’s more, the company is going to be granted special privilege to decimate resources and pollute the environment. As TFTP reported in April, Foxconn was given a blank check to drain 7 million gallons of water a day from Lake Michigan—at no cost to the company. On top of the water controversy, the DNR has also granted Foxconn air permits to pump pollutants like volatile organic compounds and nitrogen oxides into the air. To “create jobs” local residents are being forced out of their homes in order for the state to collect the property needed for the plant’s massive footprint. Despite public backlash, the plans to build the plant have mostly gone forward undeterred, according to Vice. In total, for building their $10 billion factory in Wisconsin—where they will have access to free water, a permit to pollute, and legally kick people out of their homes—the taxpayers will shell out $4.5 billion in incentives. “This is a once-in-a-century opportunity for our state and our country, and Wisconsin is ready,” said Walker at the time of the announcement. But if it’s “creating jobs” and taking back jobs from China, it’s a good thing, right? Well, how many jobs is it really taking back? As stated above, this massive giveaway to Foxconn—under the ostensible nature of creating jobs—will only create between 3,000 and 13,000 jobs. Doing the simple math, the government is paying Foxconn, on the lower end, roughly $1.3 million in tax incentives—per job. Ironically, the state is using taxpayer dollars to lure a company to create “jobs” at which people have been documented killing themselves due to horrific working conditions. The problem became so out of hand in 2010 that Foxconn had to install suicide nets around the buildings to keep their workers from jumping out of the windows. No one here is arguing that companies shouldn’t be able to compete inside the US, adding to the free market to create jobs and grow the economy. However, this is hardly competition and most certainly not the free market. It is the opposite. This is government propping up a corporation at the expense of the taxpayers and the environment. It is welfare being pushed onto citizens by those who claim to be against welfare. This is corporatism to the highest degree. Sadly, it will likely be accepted by the ostensible right who will use it as a reason to claim Trump “helped the economy”—property rights, resources, and the environment be damned.